There is often confusion over how tall a figure should be. The height will depend on two factors - the average height of the real subject and the scale being used. These notes provide an explanation of both so that a better judgement can be made of the size of any figure. The average height of a human being has varied through history as a result of changes in diet, medicine and various other factors, mostly social and environmental. The rate and direction of this change varies in different parts of the world and at different times, and of course different genes mean that different groups that effectively share a similar environment may still have different height patterns. 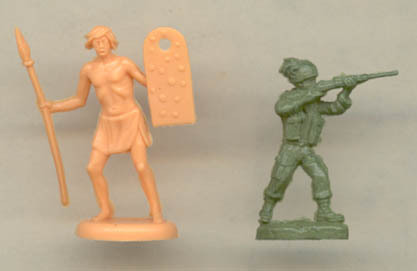 For models of soldiers another factor will be deliberate selection - for example grenadiers and elite units have generally been reserved for taller men in many armies, although most armies usually deliberately recruited from the taller men as they did, and still do, have a minimum height requirement. Finally, gender is also clearly a factor as men are on average noticeably taller than women. We have found no authoritative source of information on global human height throughout history - simply fragmentary references to certain groups and certain periods, some of which are contradictory. Fortunately the small size of 1/72 scale figures means any great precision is unnecessary, so we have put together a brief (and of necessity grossly generalised) overview of human height through history. Beginning with Europe, it seems the average Roman male was about 1.65m (22.9mm) tall. Vegetius refers to a minimum height requirement of 1.72m (24mm) for some units, which illustrates the likely taller-than-average nature of most armies through time, although whether this minimum height was always achieved, particularly in moments of crisis, is far from certain. Also it is commonly reported that northern Europeans such as the Celts and Germans were noticeably taller than those in the south - a feature still slightly evident to this day. By around the year 1000 the average height for a northern European was around 172m (24mm), which may not have been much different from when the Roman Empire was at its peak. In the following centuries average height declined slowly, so that by around 1650 it stood at 1.66m (23.1mm) before slowly starting to rise again, so that by the war of Napoleon average male height was perhaps 1.67m (23.3mm). For the modern period we do have solid data, and we know that the average modern European is about 1.77m (24.7mm) tall. There is no information on America before colonisation, but by the time of the American Revolution Americans were noticeably taller than their European counterparts. During the 19th century the average actually dropped (largely due to the character of immigration), before rising again during the 20th century. Today citizens of the USA are about the same height as the average European. For Asia the data is even less clear. For various reasons Asian peoples were mostly significantly shorter than those in Europe, with an average male height of 1.56m (21.8mm) more or less constant up to the 19th century, when contact with the rest of the world starting making a significant impact. By the 1930s the average was 1.67m (23.3mm) in China and today it is about 1.72m (24mm), although there are still differences between north and south. Finally people naturally vary in height, but this is not by more than 10% from the average - more than that is seen as exceptional and rare. In any event a set of figures should seek to show the individuals at average height, not at an obtainable but very unusual height. Models can come in any scale, and there seem to be a bewildering number that are commonly used. To begin with, a scale can be represented in one of three different ways. The first is the most obvious - simply expressing the scale as a ratio, for example 1:72. In the modelling world this can be written as either 1:72 or 1/72 - they mean the same thing. Quite simply, this means every part of the model is that fraction in size of the real thing. The second form of expressing model scale is using an absolute measurement, for example 25mm. This seems to have started when Britains began making figures in what they called 54mm scale. The measurement, which is mostly used only for figures, is the distance on the figure from the sole of the foot to the eyes, although some companies use different criteria so beware of inconsistencies! With this method all the differences in average height discussed above are ignored as all the figures are the same height, and equally individuals such as Napoleon (165cm tall) and Abraham Lincoln (185cm tall) should in theory also be the same. Finally there are scales that are referred to by name, for example 'HO'. These are mostly confined to the world of model railways, although some older sets such as those from Atlantic are described as being 'HO' scale. This website is concerned with 1/72 scale models, which is by far the most popular smaller scale for plastic historical figures, but also encompasses other scales that are close enough for most people. Incidentally, the odd figure of 72 is based on a 6 foot man being scaled down to 1 inch in old imperial measurements, and exists because when the scale was invented in the 1930s the modelling world was dominated by UK and US manufacturers, where metrication had yet to occur. Apart from 1/72 scale, a few older military models were created in 1/76 scale. This derives from the model railway 00 scale, and is not used today for military figures. However some figures such as the Matchbox range were created in this scale, so as a result they are slighter smaller than 1/72 scale, though natural variances in human height can help to explain away the differences. However the same cannot be said for equipment etc, where differences in scale are more obvious. HO scale is another railway scale, and equates to 1:87, so figures in this scale are quite noticeably smaller than the rest. So what height should those figures be? Well, taking the 1/72 scale, we can see that an average Roman man should be about 22.5mm tall, while an average Napoleonic man would be 23.5mm and a modern soldier about 24.3mm. Obviously these are very small measurements, and the task of reducing a large master figure to just the right height model is not without difficulties, but these figures are a reasonable guide to what to expect from 1/72 scale figures. 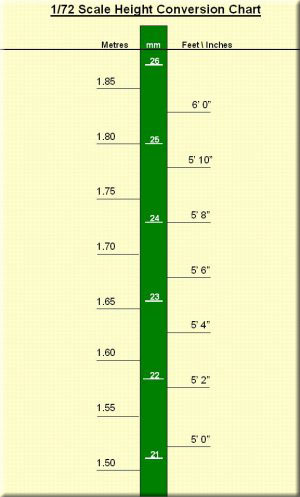 Below is a chart showing the approximate conversions for figure heights in 1/72 scale.